Poster for Asia... you see Andy Lau. I heard a lot about this movie on Facebook and when I saw that my friend Judy Sang was watching it, I decided to find out what she thought of it. Were you pissed off at first that it was starring Matt Damon? Or did this make it more interesting? Are you fans of Matt Damon in General?I am not a fan of Matt Damon but respect him as a good actor and writer. I initially was horrified to hear him starring in a Chinese movie and being the lead actor and hero. But after watching the movie and seeing the storyline - it made sense to have a white actor be the lead (did not matter if it was Matt Damon or another white actor). 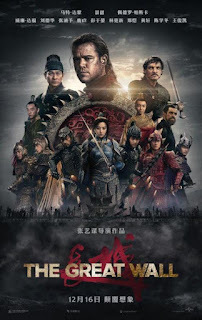 Also, I learned later that the movie was written in Hollywood and Zhang Yimou was hired to direct the movie and so it was a Hollywood movie and not a Chinese movie. Are you bigger Andy Lau or Matt Damon Fan?I am definitely a bigger fan of Andy than Matt. I grew up watching all his movie and listening to his canto-pop music. I like him more as an actor than singer. I went to see the movie because of him and the director. I love the director's movies. A lot of people on Facebook were calling to boycott the movie. What do you think about this?I think the boycotting is a bit of an overreaction once you learn it is a Hollywood movie and the story is kinda weak and has no connection to Chinese history and the history of the Great Wall. It was all action with a weak script. What made you want to watch the movie?The director. I am a humongous fan of his work. I also was excited to see Andy in a Hollywood movie. I was very disappointed to see the director direct a movie that was not his own and the quality of the script bring horrible. Also, Andy had a mid-tier role. How was the movie? Was it better or worse than you expected? The movie was worse than I expected. 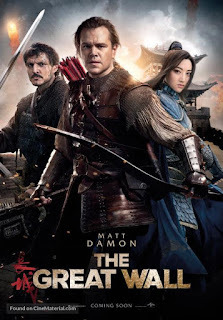 I had high hope on it giving the American audience a taste of Chinese history snd history of the Great Wall. The movie did none of that and was poorly written. The visual was good and the director is famous for that. Do you think a movie like this is good or bad for Asian Americans in general? (Or neither)Neither once I learn it was a Hollywood movie. It had nothing to do with Asian Americans since it was a stupid story with no Chinese history. It could have been a movie about another historically Wall. Would you like to see more movies like this even if it has a white leading role? No, unless the script is better and involve the history of white people in Asia. Another friend, Caroline also saw the same movie and had a different perspective. "When I first heard about the movie last year, I was surprised that Matt Damon was cast as the main actor when everyone else is Asian. After seeing the movie, he was good in the movie though it's more for entertainment. If it was someone else portraying the character, the actor would need to be of the same caliber. I have no emotions about Matt Damon. I am a fan of Andy Lau. I didn't hear about the boycott. What was the context of the boycott about? Would need more information before I can answer this question. I had no expectations for the movie. To me, it is entertainment and not a historical context. I did look up taogao (sp) which is a mythical creature. It helped to bring the Asian actors to the forefront and majority were good. Though what bothered me is the scenes with the emperor which showed him like a child. The child is weak and afraid instead of being a strong character, mindful of responsibilities and strong."